A massive ransomware campaign hit computer systems of hundreds of private companies and public organizations across the globe – and this is believed to be the most massive ransomware delivery campaign to this moment. The Ransomware in question has been identified as a variant of ransomware known as WannaCry (also known as 'Wana Decrypt0r,' 'WannaCryptor' or 'WCRY'). Like other nasty ransomware variants, WannaCry also blocks access to a computer or its files and demands money to unlock it. 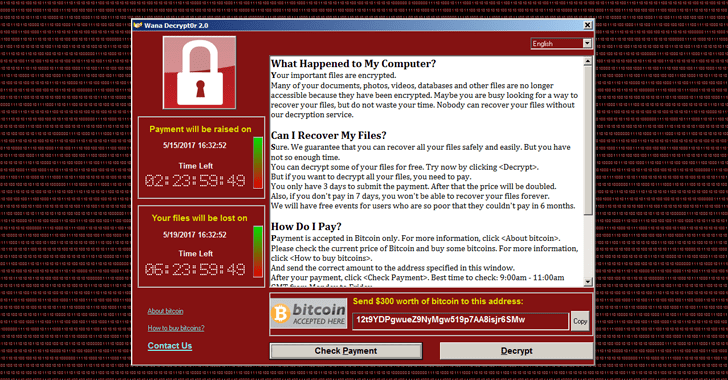 Once infected with the WannaCry ransomware, victims are asked to pay up to $300 in order to remove the infection from their PCs; otherwise, their PCs render unusable, and their files remain locked. In conjunction, researchers have also discovered a massive malicious email campaign that's spreading the Jaff ransomware at the rate of 5 million emails per hour and hitting computers globally. In just a few hours, the ransomware targeted over 45,000 computers in 74 countries, including United States, Russia, Germany, Turkey, Italy, Philippines and Vietnam, and that the number was still growing, according to Kaspersky Labs. According to a report, the ransomware attack has shut down work at 16 hospitals across the UK after doctors got blocked from accessing patient files. Another report says, 85% of computers at the Spanish telecom firm, Telefonica, has get infected with this malware. Another independent security researcher, MalwareTech, reported that a large number of U.S. organizations (at least 1,600) have been hit by WannaCry, compared to 11,200 in Russia and 6,500 in China. Is my computer at risk ? 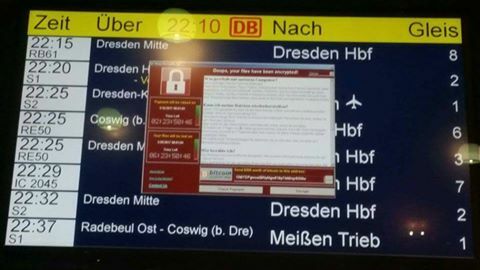 The WannaCry virus only infects machines running Windows. If you do not update Windows and do not take care when opening and reading emails then you could be at risk. You can protect yourself by running updates, using firewalls and anti-virus software and by being wary when reading emailed messages. It might also be worth taking a back up of key data so you can restore without having to pay up should you be infected. How to Protect Yourself from WannaCry ? First of all, if you haven't patched your Windows machines and servers against EternalBlue exploit (MS17-010), do it right now. To safeguard against such ransomware infection, you should always be suspicious of uninvited documents sent an email and should never click on links inside those documents unless verifying the source. There is a tool developed by Symantec that will close the SMB or SAMBA port number 445 on your computer, that will protect you from the WannaCry Ransomware. All technical information about the ransomware is gathered WannaCry GitHub.